Essential Starr - Integrated Healing Arts utilizes the technology of Bio Electro-Stimulation Technology for deeper penetrating, faster, longer lasting pain relief for a more serious acute or chronic condition. 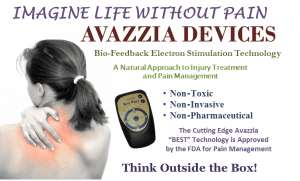 The Avazzia devices are cleared by the FDA as the latest generation of microcurrent, neuromodulation for symptomatic relief and management of chronic, intractable pain, and adjunctive treatment in the management of post-surgical and post-traumatic pain. Pain affects more people than diabetes, heart disease, and cancer combined. Back Pain affects 8 out of 10 people at some point in their lives. Carpal Tunnel Syndrome affected 3.1 million U.S. workers in 2010. Chronic Pain costs the US. economy $150 billion dollars a year. Our body is an electromagnetic system that functions as a human Bio-computer which communicates via microcurrents. Any congestion inside and outside the cells can equal pain. The Avazzia technology is a non-invasive microcurrent system that transcutaneously communicates with the internal peripheral nervous system for the purpose of therapeutic intervention. Each tissue has its own specific electrical frequency which may be disrupted by injury or disease. Microcurrent therapy simply restores normal frequencies within the cells, resulting in remarkable improvements in pain, inflammation, and function. Extremely low-level electrical currents (microcurrents) are used to treat nerve and muscle pain, inflammation and other health challenges. The Avazzia non-invasive microcurrent system communicates transcutaneously with the internal peripheral nervous system for the purpose of therapeutic intervention. High-speed microprocessor establishes a cybernetic loop between the Avazzidevice and the body. The body’s response is measurable, creating information for the loop. When a signal is emitted and penetrates deep into the tissue, the impedance of the tissue modulates the next waveform. The degree of modulation is based upon the changes of impedance of skin. This sets up a constantly changing interactive bio-loop processing non-repeating signals. Eventually, the change in impedance diminishes in significance until a plateau occurs. C Fibers and A fibers are activated with Avazzia devices, promoting the healing of tissue. Application to the skin can increase perfusion, thus improving blood circulation, lymphatic drainage, increase neuro-peptides, handle pain management, give a sense of well being, restore normal electrodynamic properties of tissue, and normalize cell signaling. The Avazzia devices are not recommended if there are pacemakers and other electrically powered implanted devices, pregnancy, cardiac arrhythmias, cancer and cancerous lesions, organ transplants or open wounds.